When it comes to choosing a fitness tracker, the last thing on some people’s mind is the device’s fashionability. Of course, style alone should not be enough to make a fitness tracker worth the purchase. Thankfully, with the Bellabeat Leaf fitness tracker, no sacrifices have to be made. In fact, the Leaf is not only one of the most stylish fitness trackers on the market, but it also has all the best features of the other, more bland trackers — and more. Designed for females, the Bellabeat Leaf includes the features you’d expect from a fitness tracker (pedometer, activity tracking, sleep monitoring, etc.) as well as a period calendar, guided meditation exercises, stress level monitoring, and inactivity alerts for whenever you haven’t exercised in a while. The Leaf’s data to be quite accurate, for the most part. The step counts and calorie trackers were slightly less accurate than other fitness trackers, but the difference in accuracy is minimal and should only matter to the most data-obsessed fitness gurus. If you’re like us, as long as the pedometer is within a hundred steps or so, we’re satisfied. If you follow the Leaf’s manual and wear the device correctly, you shouldn’t have a problem with your data’s accuracy. As for sleep monitoring, we found the data to be fantastic. You may have to manually edit your sleep data from time to time, but this is easy to do from the app and takes very little time to accomplish. One reason you may need to edit your sleep data is if you like to read before sleeping, as the device may think your motionlessness means you’re sleeping. This same thing happens with any fitness tracker that tracks sleep, so it shouldn’t be a concern for you. It should be noted that the device itself has no screen, so you’ll need the accompanying app to access all of these features and the data the device collects about your health. This is nothing new, as all modern fitness trackers come with some kind of app. In this case, however, you won’t have as easy access to your information (steps taken, calories burned, etc.) as with other trackers. You’ll have to sync your device with the app whenever you want to view your data. We don’t think this is that big of a deal though and is a small price to pay for a tracker that looks great. A whole slew of features that most other fitness trackers leave out — guided meditation, period calendar, stress tracking, inactivity alerts, vibration wake-up alarms. Even sleep monitoring is something some fitness trackers lack. The Leaf is at the forefront when it comes to the amount and variety of data collected. Let’s not forget one of the device’s most flaunted features — the device is stylish and can be worn in a variety of ways. A 6-month battery means you don’t have to regularly expend the effort to plug in your device to charge it. The bracelet that comes with the Leaf does not secure the leaf very well. You may want to look into getting a better bracelet on Amazon or Etsy if you plan to wear the tracker on your wrist. The device must be synced manually whenever you want to transfer your data from the device to the app. This “quirk” was intentional, however, as this is what allows the device’s battery to last up to six months. The syncing process is not complicated or lengthy, thankfully. The device has no built-in screen — if you want to view your current number of steps or calories burned, you’ll need to sync the device to your phone first. The leaf could be better at step-counting. It isn’t bad, by any means, just not as accurate as other available fitness trackers. You’re probably looking for a fitness tracker with a specific set of features, and chances are the Leaf has all of them, in addition to some additional features you didn’t know you’d want. If you’re into sleep monitoring, you can sleep easy knowing the Leaf’s sleep tracking is one of its most solid features. The Leaf also comes with an assortment of stress-related functionality to help you keep your mind and body operating at their healthiest. Sleep monitoring is, of course, a vital aspect of the Leaf’s stress-monitoring capabilities, but the Leaf also has other ways to monitor and help you eliminate stress. For one, the Leaf’s app contains guided meditations. This feature, coupled with the Leaf’s inactivity reminders, should help you stay relaxed and mindful throughout the day. We think it’s also nice to follow along with the app and meditate at night before falling asleep. The app attempts to measure your “stress” levels using the data it collects from day to day. From this data, you can observe when the app thinks you’ll be the most stressed and try to preemptively combat stress on those days with meditation, exercise, occasional breaks from work, or whatever works best for you. The period calendar feature is perhaps the Leaf’s most unique feature. Although you could keep track of this information using other apps, it’s much more efficient to have it included in the same app as all your other health and fitness data. With the period calendar, you’ll have no problem keeping track of your body’s natural cycles, and you can have peace of mind knowing you don’t have to track this information elsewhere. Inactivity alerts and vibration alarms also exist to help you take your mental and physical well-being into your own hands. With inactivity alarms, you can choose to be gently reminded when you’ve been inactive for a while. When you receive a gentle vibration from the Leaf, you’ll know it’s probably time to take a short break from whatever you’re doing — go for a walk, stand up and stretch, or just take a few deep breaths and allow your mind to refocus on the task at hand. Especially nowadays, it’s quite easy to get distracted. And often it’s difficult to get un-distracted until it’s too late. The vibration “wake up alarms” can be useful for more than waking up in the morning. Try setting vibration-alarms at various times throughout the day. We found it super helpful to set a few alarms at the times throughout the day when we most often experienced a decrease in energy and focus. At these times, we would go for a brief stroll (and have a cup of coffee, if we were feeling particularly exhausted). Using the Leaf’s alarms, you won’t have to touch your phone at all, preventing any chance of getting distracted by the notifications your phone may have accumulated since you last used it. The Leaf, since it resides on your body, doesn’t have to vibrate as loudly as a phone, meaning it will be less likely that those around you will hear your alarm too. A six-month battery life and no charging mean you won’t have to worry about your alarms not going off because you forgot to plug the device in at night. The Bellabeat Leaf fitness tracker and the accompanying app keep track of nearly everything you might need it to. The app does not track food and nutrition, but chances are this functionality would have made the app too feature-filled — fitness tracker apps usually don’t track this, in general. Instead, they rely on a separate app to fill this need, if you happen to desire this functionality. The data that the app does collect is quite accurate. The Leaf can track steps taken most accurately when you wear the device in certain locations. Otherwise, the device may be slightly off when it comes to your daily totals. Just be sure to wear the tracker appropriately, and you’ll be good to go. In addition to steps taken, the Leaf tracks distance moved, calories burned, and active time. The sleep monitoring functionality of the device is arguably its best, in terms of accuracy. Though the rest of the data is certainly accurate, the sleep data collected is the most accurate. It was a welcome surprise for us, as well as many customers, how well the Leaf tracks the amount and quality of sleep each night. You can also easily set sleep goals to keep tabs on whether you’re getting enough sleep. If you take advantage of the Leaf’s meditation capabilities, you’ll also be able to see the times and lengths of all your meditation sessions. You can set meditation goals so that you can be sure you’re meditating as much as you want to. If you prefer to meditate in your own way, without the app’s built-in meditations, you can manually enter these sessions into the app too. When it comes to stress tracking, there are a variety of factors at play. The Leaf uses the various types of data collected to calculate the effects of the following on your stress — activity, sleep, meditation, your period cycle, pregnancy, as well as your “stress sensitivity.” Remember, this is just a prediction, but it’s a prediction informed by your own data. The last statistics that the app provides you with are related to your period. The app provides period tracking, fertile tracking, ovulation tracking, pregnancy tracking, as well as reminders to take pills. This functionality can be turned off if you don’t need it, but we think it’s quite useful to have bundled in with the rest of the app’s features. Stylish –The Bellabeat Leaf looks fantastic clipped to your shirt or pants, as a bracelet, or as a necklace. This fitness tracker doesn’t look like your traditional fitness tracker — and that’s a good thing. Simple to use – There isn’t anything overly complicated about the Leaf. It has a 6-month battery life (no charging required), no screen, and is simple to sync with your phone. Without a screen, you won’t feel compelled to be constantly checking your steps and calories burned throughout the day, leaving you to focus on the tasks at hand. A panoply of data – You’ll feel more informed about your health and fitness than ever before with data regarding your sleep, activities, reproductive health, meditation habits, and stress levels. Reproductive health monitoring – The Leaf is the only fitness tracker (that we know of) that help you keep track of your reproductive health. We found that other customers came to the same consensus as us in their Leaf fitness tracker reviews. We conclude that the Leaf tracks a lot of different things and looks great while doing so. If you’re interested in all the various things tracked by the Leaf and don’t need to constantly be aware of your statistics (because the device has no built-in screen), then the Leaf may be the ideal fitness tracker for you. You’ll have to sync the Leaf with your device whenever you want to see all the newly-collected data it has to offer, but this process is simple & quick. One gripe customers have had with the Leaf concern the included bracelet. The clasps that secure the tracker to the bracelet don’t hold the device in place as well as they could. The bracelets also run on the small side, meaning you may not be able to wear the device on your wrist unless you have smaller wrists. These problems can be solved easily, but the fix isn’t always free. Some customers found that Bellabeat’s customer support was willing to send them a larger bracelet, free of charge. This solves the size problem but doesn’t address the stability issue. If you want a bracelet that is more suited to exercising than the bracelet that comes with the Leaf, you can find better ones on Bellabeat’s website, as well as on Amazon and Etsy. The Bellabeat Leaf’s fashionability, while obviously meant to be one of the fitness tracker’s most compelling features, is really just the icing on the cake. 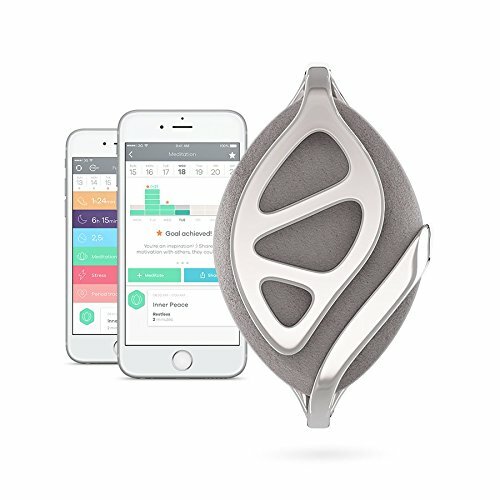 The device collects all sorts of data on your sleep, activity levels, stress, as well as your reproductive cycle, while also offering additional features to help you focus on and improve your mental and physical health — guided meditations, vibration alarms, “inactivity alerts,” and stress level prediction. If you need a fitness tracker only for a specific purpose, or if you’re not a female, the Leaf may not be for you. One of its main selling points is that it does so much. Also, if you require a constant awareness of the data collected (steps taken, calories burned, amount of activity, etc. ), you may want to look elsewhere for a device with a screen. You can easily sync your Leaf several times throughout the day to see your data, but you won’t want to be syncing it every couple minutes to see how many more steps you’ve taken. However, thanks to the Leaf’s manual-syncing requirement, the device can last up to six months before its battery needs to be replaced.